On Wednesday G. came over and we did some dyeing. I did yarn, G. did fabric. I did indigo and she did cooking pots of madder and weld. 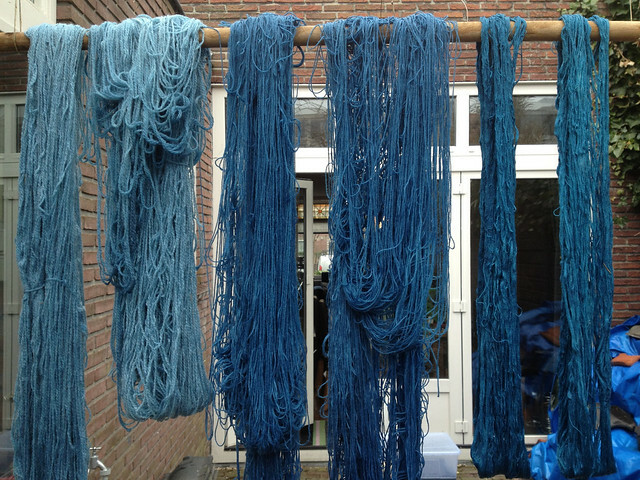 Above are the results of my first ever indigo dyeing. Left to right: 2x 100% merino wool, sport weight, 2 dips; same yarn that was previous dyed with weld (nearly 3 years ago!) and over dyed with 1 dip in indigo; 2x Cascade undyed sock yarn, superwash; 2x 100% silk lace weight. I was really curious how the different yarns would dye differently. 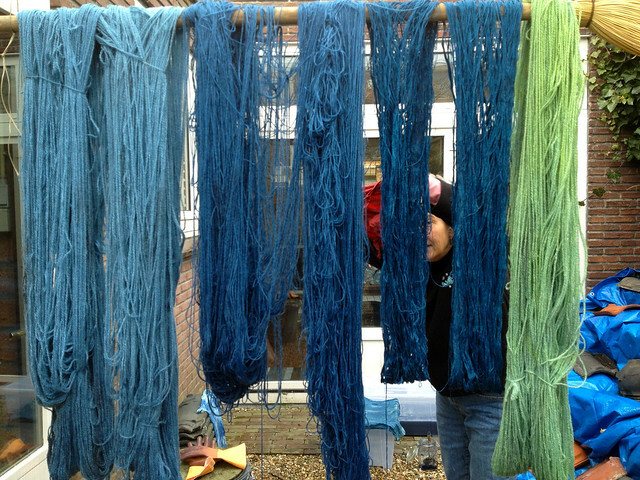 It’s true what everyone says, superwash yarn takes up dye, even natural dyes, much faster and deeper than non-superwash yarn. The silk came out beautiful too! 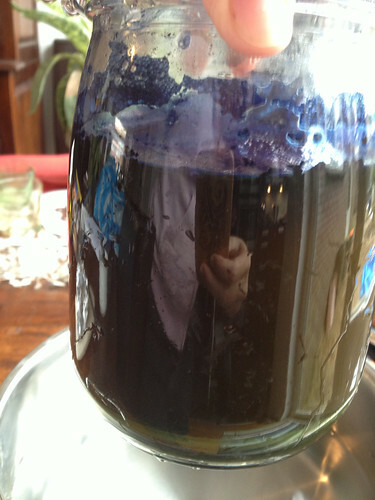 I started out in the morning making a jar of indigo powder, an alkali and a reducing agent, which turned it from blue to a greeny-brown. 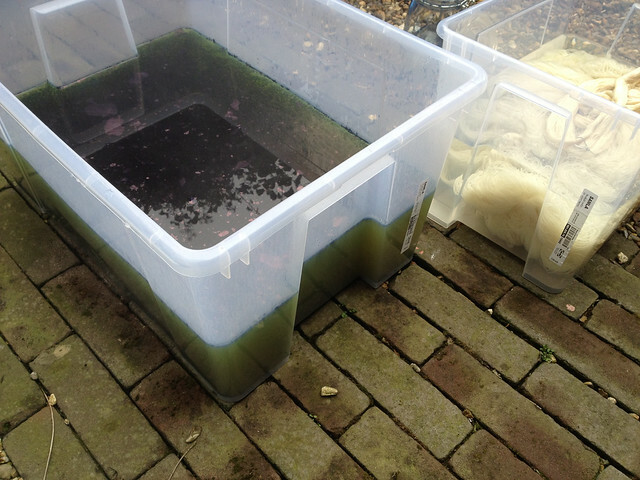 Then I filled a plastic tub with hot water and more of the same chemicals. Then gently dipped the glass jar into the tub, without disturbing it, and poured the contents into the tub under the water. All of that was to avoid getting any oxygen into the mixture. It smelled foul and looked green. Perfect! Meanwhile G. was busy mordanting fabric and stirring up her pots of color on the stove. I then dug into my bag and pulled out a skein of yellow wool that I had dyed almost 3 years ago. 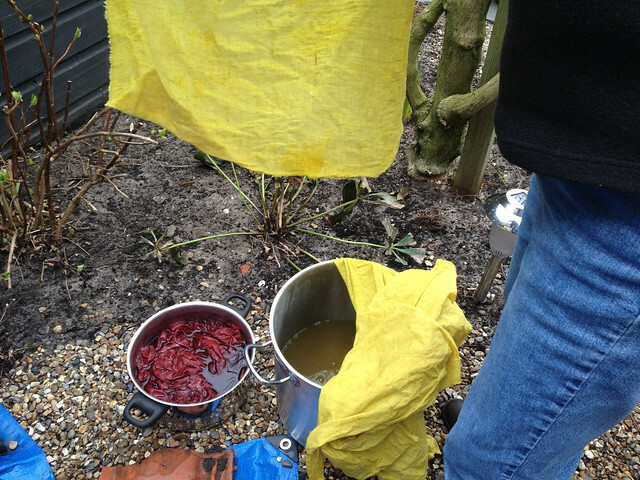 Funny, that day was also with G., dyeing in my back garden. 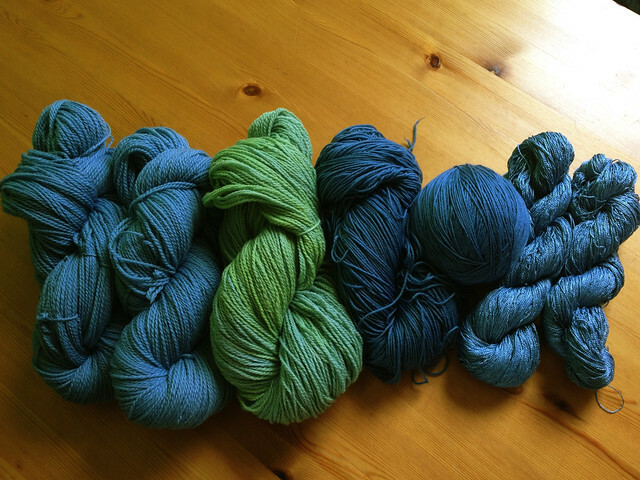 I decided to take that skein and throw it into the indigo and see what kind of green I would get. Not bad actually. Here’s my yarn after a second dip and with the newly green skein. G. is in the background showing off her bright red madder fabric. And here are some of G.’s results. It was such a fun day! I love this stuff. 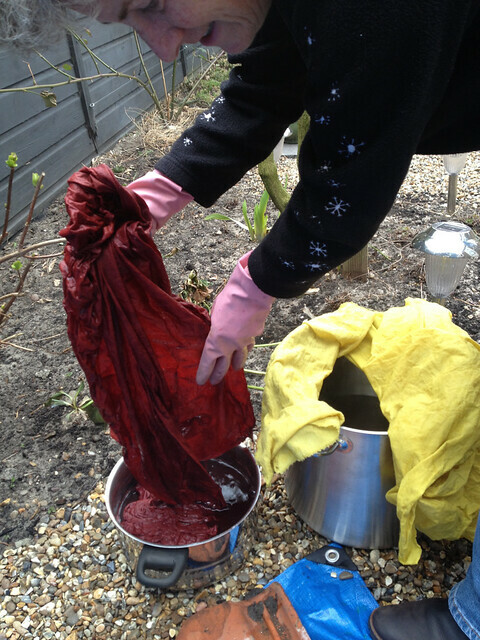 I love the chemistry and the mystery and the magic of dyeing. I can’t wait to do it again. And that might come sooner rather than later. My indigo vat is now blue, which means it still has indigo in it, but has become oxygenated. I need to put some chemicals in it again and it should turn green again and be ready to dye some more. I think I’d like to try some simple tie-dyeing on t-shirts. Why not? Isn’t that back in fashion?